The Russian Defense Ministry has said Black Sea Fleet warships have launched three cruise missile strikes on terrorist targets in Syria. A terrorist command post and munitions production site were destroyed. "As a result of the strikes a command post and a terrorist base near the village of Dar Taaza as well as a production site of mortar ammunition and an arms depot in Aleppo province were destroyed,” the ministry said in a statement. "To ensure the safety of civilians the missile flight corridor was planned over an uninhabited area." On Monday, Russia launched tactical naval drills in Mediterranean and Caspian waters. 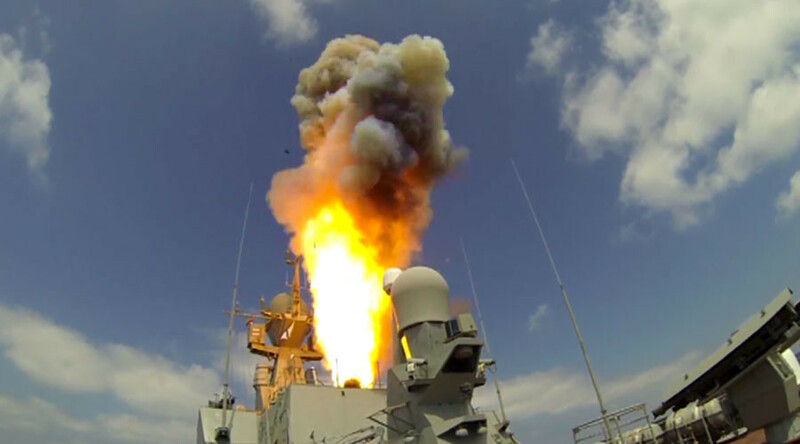 The warships taking part in the exercise engaged in live artillery and missile fire “under simulated battlefield conditions.” The Mediterranean force includes two fast attack guided missile craft, both armed with Kalibr-NK cruise missile complexes equipped with eight missiles each. On October 7, 2015, four Russian Navy warships in the Caspian Sea fired a total of 26 missiles at positions in Syria held by Islamic State (IS, formerly ISIS, ISIL). The missiles traveled some 1,500km and eliminated 11 targets. his week, Russian long-range Tu-22M3 bombers delivered their first airstrikes from an Iranian airbase against terrorists in Syria. The planes hit IS targets as well as Al-Nusra Front facilities in Aleppo, Deir-ez-Zor and Idlib provinces. The strikes have eliminated five major terrorist weapons depots and training compounds in the area as well as three command posts and a significant number of terrorists, the Russian Defense Ministry said. Last week, the Russian Defense Ministry reported that terrorists had shelled residential areas in Aleppo, with Syria’s Sana media news agency reporting that the attack resulted in civilian deaths. The Russian Defense Ministry on Thursday supported a proposal from the UN Syria envoy to conduct 48-hour weekly ceasefires to deliver humanitarian relief to Aleppo residents. The first such truce could be held next week. “Any kind of humanitarian pause and ceasefire would give a bit of time for the population, which has been suffering not only during the past weeks, but also for four years,” Ingy Sedky, from the International Committee of the Red Cross, told RT.